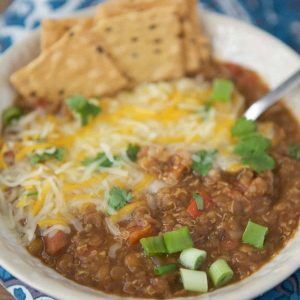 A hearty and healthy vegetarian chili recipe with lentils and quinoa. Add all ingredients to Instant Pot. After adding the spices, give everything a gentle stir. Close lid and turn pressure valve to Sealing. Set on high pressure for 20 minutes. Will take about 15 – 20 minutes to pressurize and start timer so make sure you count that as cook time. Once 20 minutes is complete, let natural release for 10 minutes. If there is any remaining pressure, you can turn to Quick Release and open lid. It is ready to serve now, or keep on warm until you are ready. Serve with shredded cheese, chopped green onion, cilantro, tortilla chips or crackers. Can be left on warm for up to 4 hours if you are not ready to serve when ready. Store leftovers in airtight container in refrigerator for 3-4 days. I love storing my leftovers in these glass storage containers. Salt will need to be adjusted according to taste, depending on the broth you use as well as the canned tomatoes and beans. I added 1/4 teaspoon to the recipe initially and then after tasting added a pinch or two until I thought it was right. This is the Instant Pot I use.